In 2005, economist Steven Levitt and journalist Stephen Dobner published a book that changed the way we think about everything from incentives and causality to sumo wrestling and abortion. Their research and case studies radically shifted the paradigm of contemporary thought, especially as it pertained to the constantly changing economy. Last year “six rogue filmmakers” tried to adapt this book into a documentary. Unfortunately the film doesn’t really do anything. The filmmakers in charge of various segments of the film were Seth Gordon (King of Kong), Morgan Spurlock (Super Size Me), Alex Gibney (Oscar-winner Taxi to the Dark Side, Enron: The Smartest Guys in the Room), Eugene Jarecki (Why We Fight) and Heidi Ewing & Rachel Grady (Jesus Camp). With such an all-star team, how could this fail? Well, it doesn’t really fail. I can’t say I disliked this film, as it highlighted a collection of interesting stories and case studies debunking our preconceived notions of the world. They seek to find the things that are actually connected causally, not just the ones that seem to be. For example, what if abortions in the 70’s helped lower crime rates in the 90’s? These are the kinds of questions the various filmmakers pose. But it is a pale imitation of the source material, and hardly deserves to share its title. The film is composed of 4 major portions and a few anecdotes linking them together with each director responsible for one segment (except for Seth Gordon, who did the rest). One segment is animated, while others alter their tone from the rest of the film; in short, it is apparent that these directors did not work together. They were asked to take a case study from the book and translate it to film – without the complication of having to collaborate to create fluidity. Perhaps the problem was that there were too many cooks in the kitchen, or maybe it was because each of them was asked to participate since they had some free time. Because there is little passion for their subject. The one outstanding segment revolves around cheating among sumo wrestlers, but otherwise, the film acts as a book on videotape – abridged to fit the time allotted. 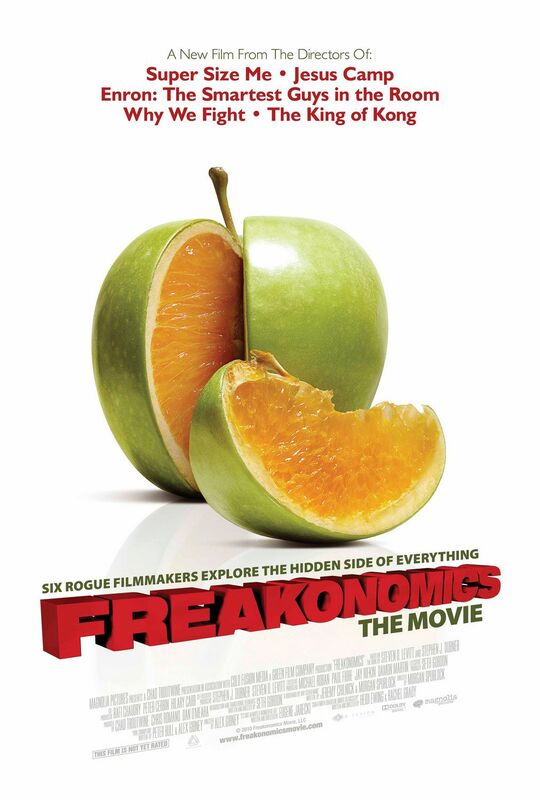 If you haven’t read the book, or if you’re thinking of reading it soon, you should see Freakonomics as it’s a nice primer to the subjects covered in the book. But if you find this interesting, just go read the book, because it covers all of this in detail. It will change the way you think. The film adaptation? Not so much. This entry was posted in Reviews and tagged Adaptation, Alex Gibney, Documentary, Eugene Jarecki, Freakonomics, Heidi Ewing, Morgan Spurlock, Rachel Grady, Seth Gordon. Bookmark the permalink.